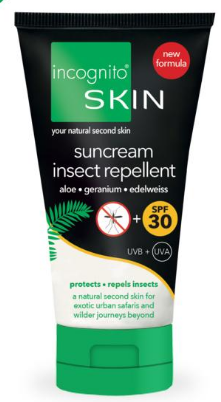 An effective non greasy moisturising insect repellent suncream which hydrates and protects your skin. The active ingredient is PMD a natural repellent found in Lemon Eucalyptus. Approved by NHS and Public Health England. 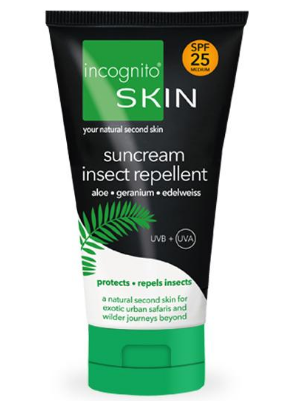 Incognito's suncream insect repellent has an award winning formula with broad spectrum SPF25 protection against both UVA and UVB rays this non-greasy lotion will protect your skin against both sun damage and ageing whilst also providing a camouflage from biting insects! 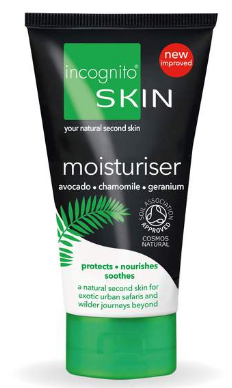 Packed full of natural and organic ingredients together with moisturising properties, this cream is multi-functional and will save you both space and time! The tube is made from sugarcane plastic which has a positive carbon footprint and is 100% recyclable. 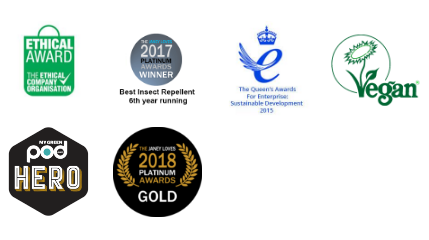 TV show Rip off Britain tested PMD for effectiveness against mosquito's and it proved successful. Watch the video below. 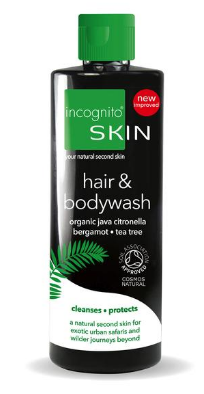 Ingredients: aqua (water), caprylic / capric triglyceride, zinc oxide, PMD (eucalyptus maculata citriodora), sorbitan laurate, propanediol, glycerine (organic), isostearyl isostearate, polyhydroxystearic acid, titanium dioxide, polyglyceryl-4 laurate / succinate, tocopheryl acetate, magnesium aluminium silicate, decyl isostearate, aloe barbadensis (aloe vera) leaf extract (organic), leontopodium alpinium (edelweiss) extract, pelargonium graveolens (geranium) oil (organic), isostearic acid, aluminium stearate, alumina, xanthan gum, citric acid, dehydroacetic acid, benzyl alcohol, sodium benzoate, potassium sorbate, citral, geraniol,linalool, citronellol, limonene. 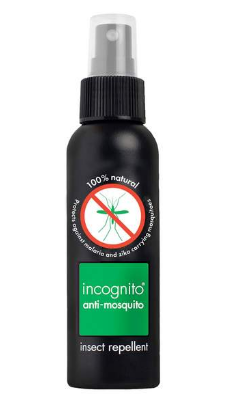 How to use Incognito suncream insect repellant; Shake well before use! Apply suncream insect repellent directly onto the skin, 15 minutes prior to sun exposure, to protect against sun and insects. Re-apply frequently (every 5 hours) or whenever necessary for maximum protection. Also re-apply after bathing/swimming. The suncream will provide you with 100% protection for 5 hours and it is still 88% effective for 8 hours. However, if you choose to, apply the spray or roll-on onto clothing for extra protection in high risk areas. Can be used on children from 2 years of age. Packaging: Recyclable sugar cane plastic tube.